N|Solid is a drop-in alternative to the Node.js runtime, enhanced to deliver low-impact performance insights and greater security for mission-critical Node.js applications. The most advanced Node.js monitoring and diagnostic tools to help identify and tackle trick issues. Deep performance insights help you build highly reliable applications and minimize infrastructure costs. Mitigate unseen security risks with custom security policies and real-time vulnerability scanning. Traditional APM tools sit on top of the Node.js runtime layer; performance overhead may vary from one application to the next, depending on the architecture and stack used. Some tools sacrifice more detailed stack trace information in an effort to minimize overhead, and none are built specifically with Node.js in mind. With N|Solid, there's no need to sacrifice performance in order to get data. A low-impact native C++ agent runs on its own thread alongside your application with direct access to the internals of Node.js. Data collected from your application is organized and displayed within the N|Solid console. N|Solid is a fully-compatible alternative to open source Node.js, with versions available for all active LTS release lines. You can use N|Solid in place of Node.js to run your applications without modifying any application code. High-definition, low-impact performance serverless monitoring is now available for Google Cloud Run on GKE using the N|Solid Runtime as a custom base image. Get a high-definition view of the performance and behavior of serverless functions by using the N|Solid Runtime, available as a Layer for AWS Lambda. Running Node.js in the cloud? N|Solid is available for use with AWS, Google Cloud Platform, and Microsoft Azure. For containerized Node.js applications, N|Solid also includes Docker and Kubernetes support out of the box. Production monitoring of application behavior and overall system health provides deeper insight into application issues. Comprehensive Node.js metrics help you identify the source of memory leaks or other performance issues and resolve quickly, reducing the risk of an outage. The scatterplot process visualization lets users with large-scale Node.js deployments view hundreds or thousands of processes on a single unified scatter plot. Toggle on process tracing to track changes in behavior over time, or customize axes to correlate your choice of 50+ metrics. Built-in CPU profiling and heap snapshots allow for instant analysis and swift resolution of application-threatening issues. Profiles and snapshots can be analyzed directly in the console to quickly triage performance issues. 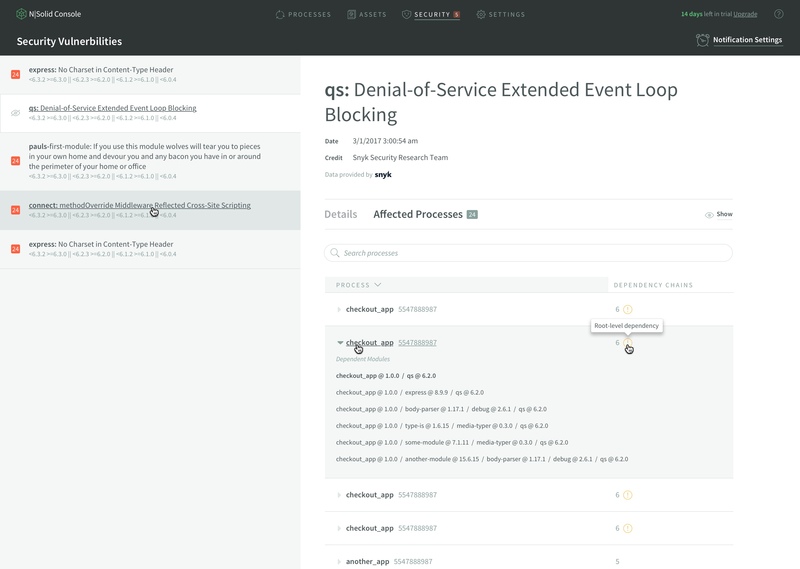 N|Solid lets you automatically trigger an alert when thresholds are exceeded or when a new security vulnerability is detected. Thresholds and associated notifications can be made as specific and urgent as needed. Notifications can be sent by email or through direct integration to your team’s Slack channel. You can also use webhooks to send notifications to your preferred external system or platform. N|Solid performs periodic verification of all packages loaded by Node.js processes in your application environment. Packages will be checked against a list of known vulnerabilities, and any newly-found vulnerabilities are reported in the console; optionally this can also trigger a notification. N|Solid ships with configurable security policies to help harden your applications. By creating a policies file using standard JSON format, you can set the severity level (ignore, warning, throw error, exit) of access restrictions for core Node resources—modules and bindings. N|Solid makes it easy to send Node.js application performance data directly to any StatsD-compliant system with a simple configuration change, making it easier than ever to integrate runtime data into existing team workflows. 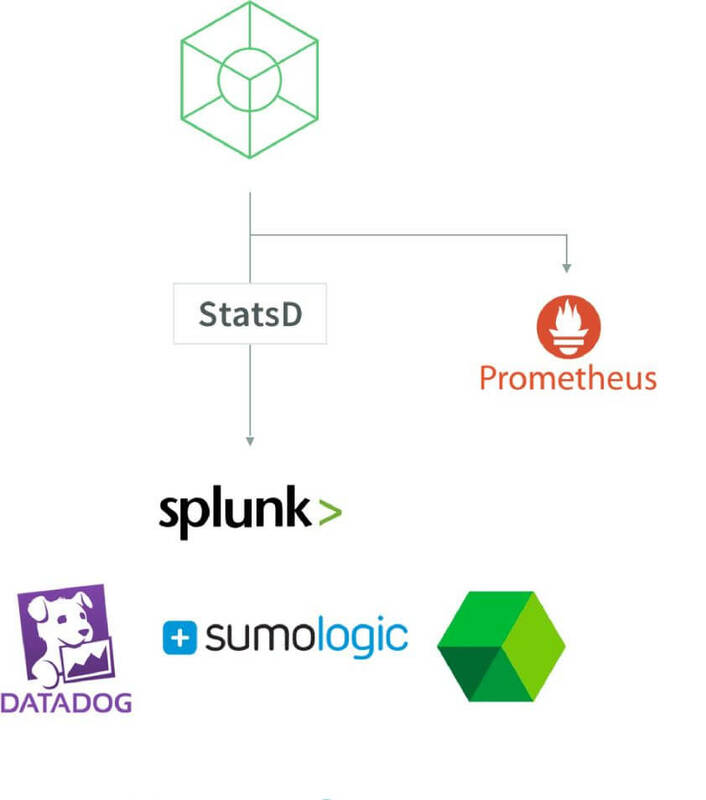 By dispatching metrics to StatsD, N|Solid offers an easy way to deliver a rich variety of Node application metrics directly to your organization's preferred monitoring or reporting platform, while still taking advantage of unique N|Solid features like snapshots, application profiles, and threshold-based alerting. Ready to try the platform built for Node.js?